The Woodridge family would like to partner with you to help your children face the challenging obstacles in the world today from a Christian perspective. Our hope is to encourage your children to make good decisions, create positive friendships and have a place to belong while encountering God, and discovering God’s purpose for their lives. Our vision: a faith formation program for children and youth that nurtures their growing faith and personal relationship with God. Our goal: to integrate our children and youth into all aspects of church life, including worship, music and mission and service. In our “Music Ministry,” we draw upon the musical gifts of our young people and enjoy their talents in worship services, including a children’s chimes choir. On-going mission projects and collections are integrated into the Sunday School program. Dedicated teachers prepare for each class and work together to engage our children and youth in the Christian faith in fun and age-appropriate ways. Our curriculum is deeply rooted in the basics of the Christian faith and bible based. If you haven’t already registered for Sunday School, you may copy the attached form, fill it out and bring it on Sunday. Worship begins at 10 am. Children over the age of 2 are invited to stay in worship until after the children’s message with the Pastor. Sunday School begins right after the “Passing of the Peace”. Directions are noted in each Sunday’s printed bulletin. This is a special ministry for this church. The nursery is staffed every Sunday during the regular school year by an adult at the start of worship at 10 am. Parents are welcome to drop off their child and return to worship. Parents are also invited to stay in the room if they feel that is what their child needs. A speaker in the nursery provides audio reception of the church service. Our Junior Youth Group (grades 3 through 7) and Senior Youth Group (grades 8 through high school) offer young people age-appropriate opportunities to explore their faith and build fellowship. Fun events with kids from other churches, regular meetings, mission trips and other service projects help kids connect with their Christian community. Please see the pastor for more information about having your child baptized or if you want to know more about the confirmation program for ages 8th grade and older. 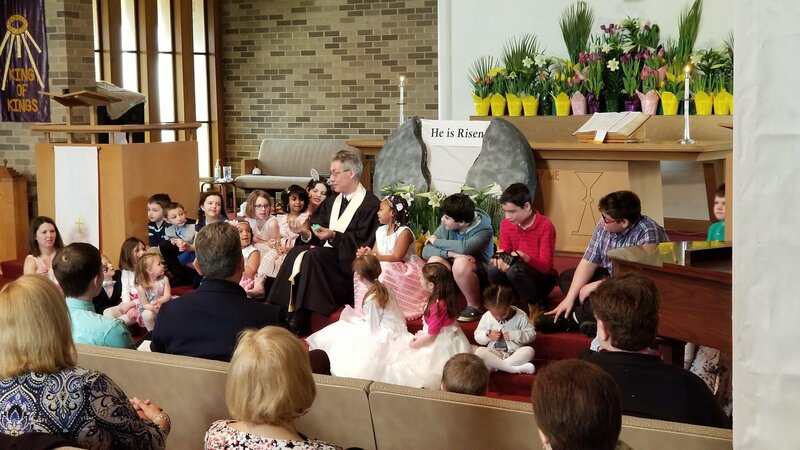 Throughout the year, the children participate in programs during special times in the church. We celebrate at the beginning of the school year with a “Rally Day / Open House”. In October we celebrate “World Communion Sunday” and at the end of the month we host a community Trunk or Treat. In November, we have a thanksgiving lesson. December of course is Advent and the students perform a pageant each year. The next big season in the church is the season of Lent. On the first Sunday of Lent, we begin a “Communion Education Class”. This is for first and second graders. This class starts at 10 am during the time of Lent. On Palm Sunday, the children perform a pageant for the church. Easter Sunday is a family worship. Our last big event of the year is Children’s Sunday. The Woodridge Church is committed to creating safe environments for all ages within our church building and in all of our children and youth activities and classes. Documentation may be found elsewhere on this site.